Say could that lass be I? 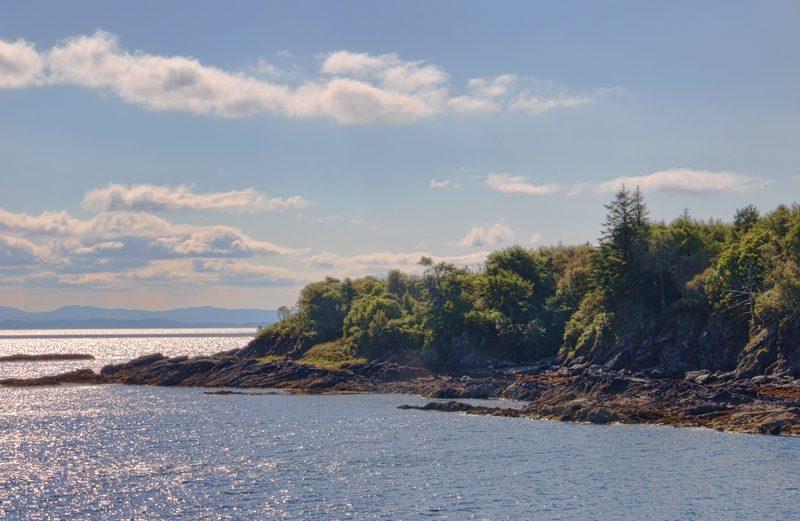 This is the view from the ferry as we sailed -- from Skye, sadly, rather than to it. This is far from the most photogenic view of the island, but you can see some of the Outer Hebrides islands in the distance, all of which are now on my Must Visit list. I will have more pictures of some of those other Skye landscapes later, when I'm not running around Scotland taking more pictures than I can look at. Despite the sun, I lasted maybe ten minutes outside before my fingers turned a patriotic Scottish blue and I retreated to the indoor seating. Once we were back on the mainland, it was warm enough to have our lunch on a nearby beach, but despite the romantic songs, actually sailing over any Scottish seas is apparently not for the faint-hearted. Or underdressed.